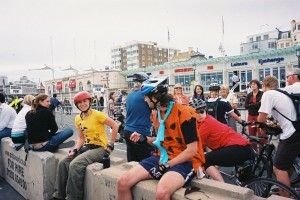 London to Brighton on skates! Back in 2006 some very fit skaters skated from London to Brighton as part of the BHF bike ride. 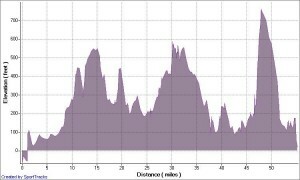 I liked the idea of it and have done marathons before (26 miles) but they tend to be flat, smooth and nothing like this. I really wasn’t sure about this so sponsorship seemed the best way to make up my mind. I don’t do sponsorship very often (I am not a fan of people that ask for sponsorship to do something they are going to do anyway) but set myself a stab in the dark target of £1000 for the Portsmouth hospitals NHS trust who looked after my grandfather wonderfully during his last days. The challenge now set it was time to train for this event… unfortunately skating is not a wet weather sport and we have had one of the wettest springs for a long time. Typically the events I have gone for in the past are at the end of the year, my fitness usually gains nicely throughout the year. This year I didn’t get anywhere near enough training in, not helped by organising skating events and starting a new job. Anyway, enough of the excuses!! As people very kindly started to sponsor me some decided to offer double if I did it in fancy dress, after a bit of indecision I figured that in for a penny and in for a pound. Jon (Lemming) kindly offered to skate with me and get dressed up too so I felt much better about that, a Fred Flintstone and Barney Rubble outfit was ordered. Jon being much taller than me had Fred although with his drinks backpack and my drinks bum bag under our outfits we did look like the hunchback versions! The day before the event I had a phone call from BBC London (radio station), they wanted to do an interview with me at 7:30am the next morning and again between 2pm and 6pm in their sports show!! I still to this day don’t know where they heard about me or got my number from! I was staying the night up in London with Jon and his girlfriend ready for the early start the next morning. At 7:30 that night (still the night before) my phone rang, we were in very loud restaurant at the time and it was the radio station (yup, wrong 7:30). 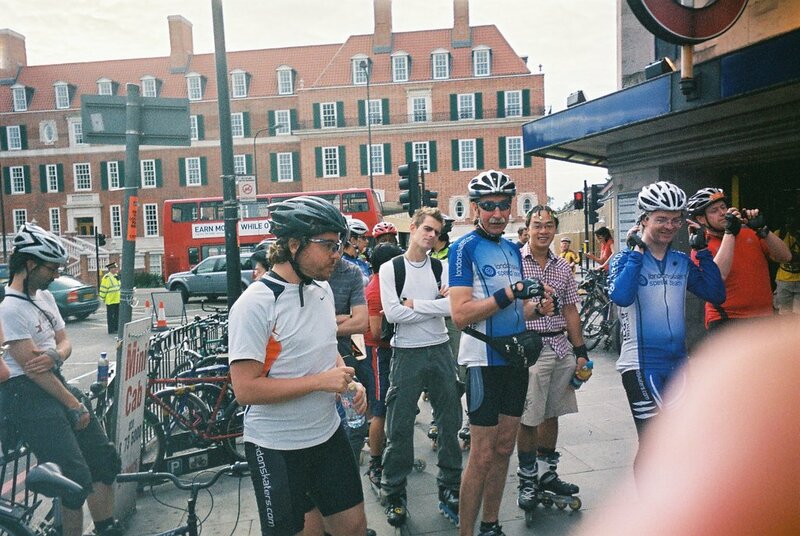 I did my interview in a phone box outside and babbled badly but managed to mention the important things such as sponsorship, the London street skates and thanking BHF. The alarm goes off at 6am, Cheryl joins us and we get a ride to Clapham Common from Jon’s lovely girlfriend. Clapham Common is heaving as expected so a quick stake through the traffic and we are at Clapham Common South tube station for 7:30 for the off. There were about 20 skaters there ready to skate with us and another 10 had left at 6am to avoid the rush. 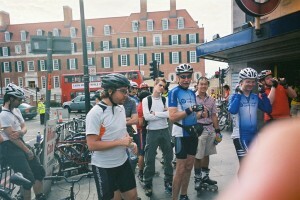 We all left promptly and after pausing for a group photo we quickly got caught in the traffic. That early on it was very hard not to go into marshal mode and nip through all the bikes and traffic but Jon and Cheryl would get left behind so I didn’t (that’s the last time you will hear me say that). I had an SMS from mum saying I had just been on the radio! They used different bits of my interview throughout the day as the “and finally” piece on the news although I would have to wait to hear it. 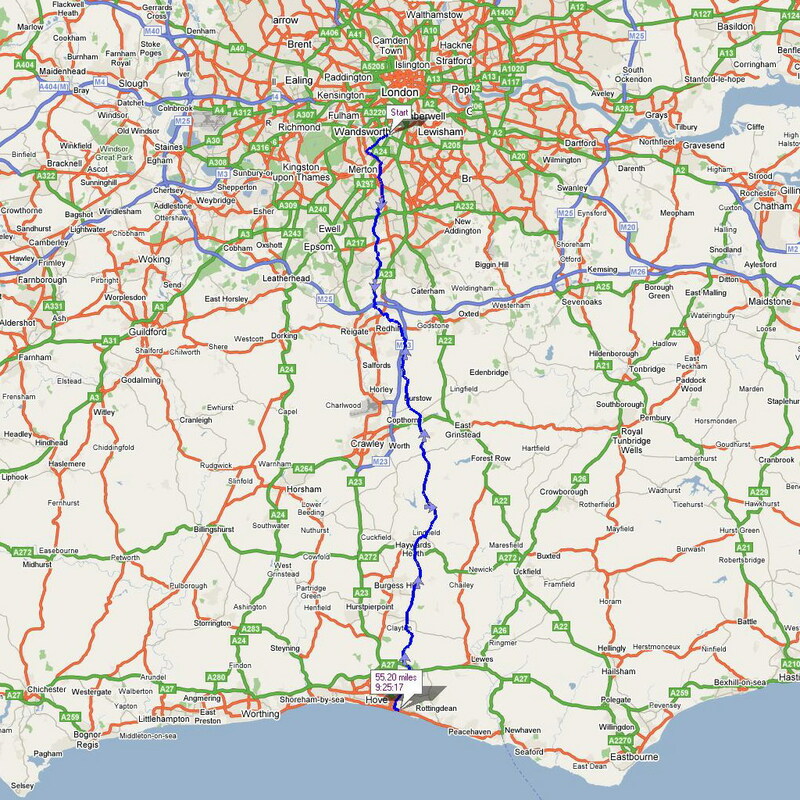 The first third of the skate was hard, very hard, it is very hilly getting out of London and really not the best roads at all. Boy was it a wake up call and really made me think about if I could do it. Jon and Cheryl kept skating ahead but very kindly kept stopping for me to catch up. 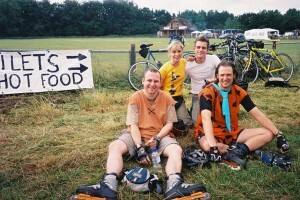 At the 18 mile mark (just outside the M25) we met my parents at one of the water stops. A lot of skaters had gathered there and it made a good rest and photo shoot before moving on. It was great to see mum and dad there and gave me the push to carry on, I still really didn’t think I could do this but I wanted to get over half way before I stopped, I couldn’t pull out this early. The next 10 miles were tough, I lost Jon & Cheryl quite quickly who were finding it hard to go as slow as me. The hills carried on now with accidents at the bottom of most where cyclists had collided and to make things worse we heard there was rain ahead. This was all we needed, the roads are bad enough without water on them. 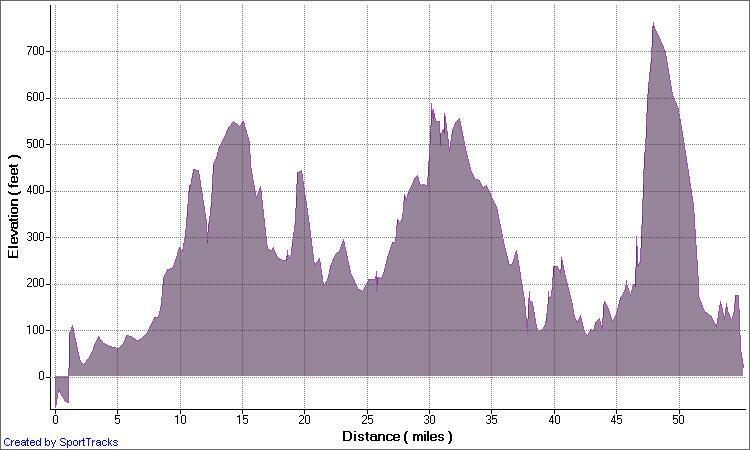 One BIG hill later and I found myself at the top of Turners Hill at the 30 mile mark. I met up with Jon and Cheryl again, we later found out that the skaters which left at 6am were in the pub opposite. It seems Turners Hill is a bit of a milestone for the London to Brighton and certainly for me, after the event, it is. We were 55% of the way there but the way we felt we weren’t sure if we could do the same again, we had already done over a marathon and had almost the same to go. 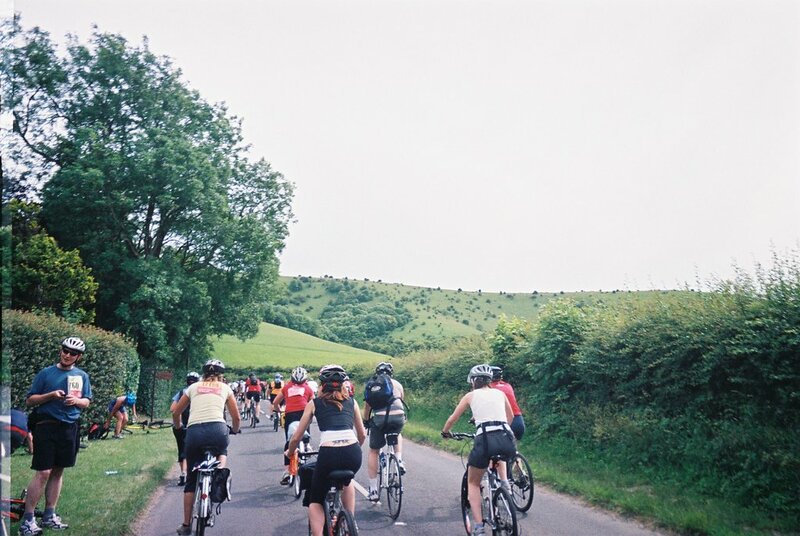 We remembered the elevation graph we had seen and seemed to remember the second half being much flatter albeit with Ditchling Beacon there too. Jon was going on holiday the next day, while he felt confident he could do it he wanted to be able to walk! Myself and Cheryl still weren’t sure we could do it but after a good long rest and feeling confident that the second half was a bit flatter we all set ourselves the task of hitting 40 miles and then probably calling it a day. After a lovely glide down Turners Hill I lost Jon & Cheryl very quickly. The next miles were hard, on my own and spurred on by not wanting to let everyone down. I would like to say a HUGE thank you to the people that called and SMS’d to encourage me on, I could not have done it without you. 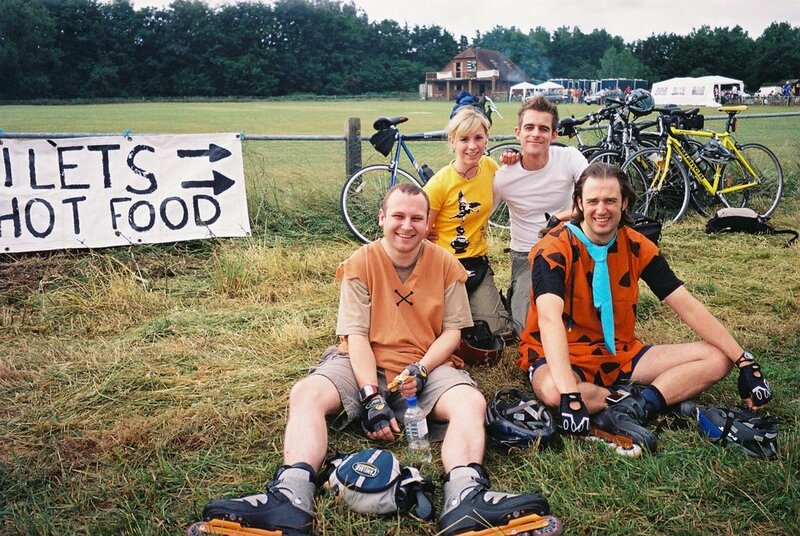 The cyclists were great too, especially being dressed as Barney Rubble they would shout “keep going Barney” and “almost there Barney”, it did help. There were two guys doing it on clown bikes where the axles are offset and the whole bike bucks up and down, funny to watch but hats off for doing it the entire way!!! The miles were still long and hard though, I kept wanting to stop but knew that would put more distance between myself and the others. 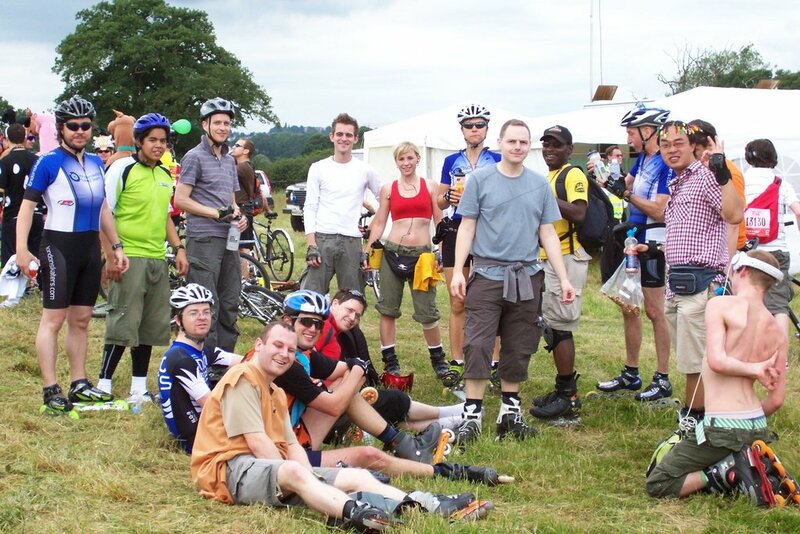 In the end I had to and collapsed for 10 mins at a scout hut that had put on food and water. I stopped a few times after that, just to catch my breath and eat a snack, I remembered being told that eating and drinking were very important but it was hard to eat when your tired. I tried not to call Jon too much as I didn’t want to hold him up but he called and while he was definitely getting further away from me he never seemed that far. 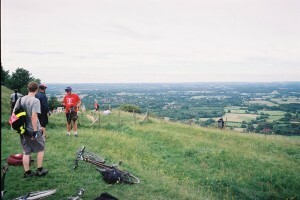 As I came into Ditchling Jon called to say they where staying at the bottom of Ditchling Beacon until I turned up. 5 mins later my phone rang, it was the radio station, I had completely forgotten about them! Worried about skating, being out of breath and loosing signal I pulled over into a side lane to do my interview, it actually went quite well even if I do say so! It forced me to have a 5 min break and because I didn’t want to sound grumpy on the radio I had put on my best cheery voice which helped the spirits. 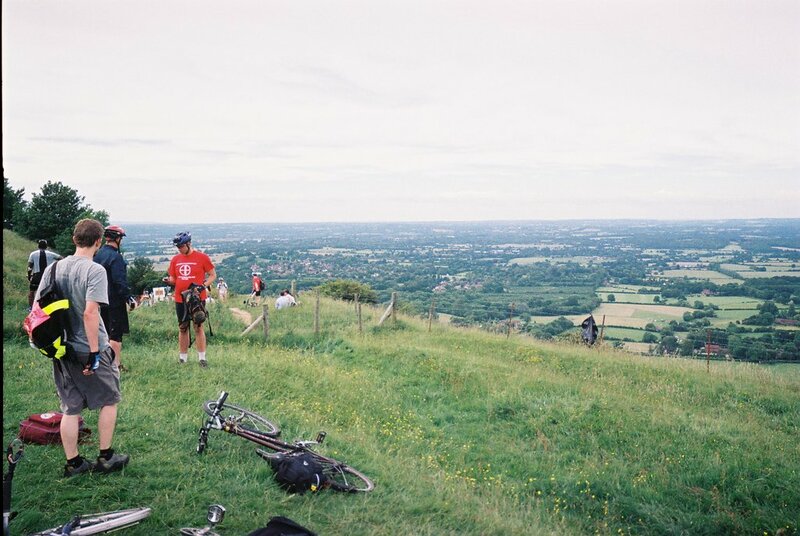 I never realised Ditchling Beacon was so far outside of Ditching village, actually, looking at a map now it isn’t but it seemed it at the time. You see the Beacon loom up in front of you too, the pictures don’t do it justice. I have a break at the bottom and call Jon to find that he and Cheryl are now at the top, it’s no good, I have to have a break. A friendly house at the bottom of the Beacon had opened their large garden up for cyclists to rest in, it was very relaxing although hard to relax knowing what was coming. My GPS read 46.5miles and I knew it was 6 miles into Brighton from the top of the Beacon, 6 miles downhill!! That makes it a 1.5 miles to the top of the beacon. I set off hoping the encouragement Jon had given me was true. We set off from the top of ditchlng (750 feet above see level) knowing that while it was all downhill to the seafront it was still six mile, I was dreading it being a big steep downhill and 5 miles of flat! It turned out to be not to bad and after a big push to stay with Jon and Cheryl we managed to pace line most of the way into Brighton which I am sure looked rather cool too, we had a few comments on it. One mile from the sea front and the traffic stopped us, while they had cone’d a single lane for us they still had to let traffic move around Brighton and so were stopping the cyclists at the lights. If I had any energy in me I would have loved to nip into the slow moving traffic and weave through them to the front as I do most Wednesdays but not today. BBC London had asked that I call them as I crossed the finishing line but apparently they were about to go to the news and so would all me back. As the final set of lights changed and we rounded the final corner to see the finish line a way down the prom. I won’t say I sprinted but I don’t think we hobbled either it was a final push over the line. 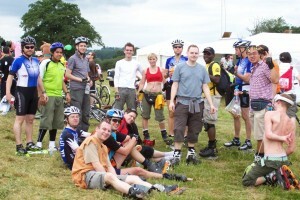 The British Heart Foundation were stamping official cyclists time cards and handing out medals. Kindly they give medals to non registered participants for exchange of a donation which we gladly did. After a sit down at the seafront we slowly made our way to the station to catch the train back. BBC London called again for their last interview, I think you can tell I am a bit tired by now. A very long queue for tickets and a sandwich later and I am falling asleep on the train back home. All in all I am glad I have done it but one week on and I am still saying never again! Not unless I become a Lycra wearing super fit speed skater and that is unlikely, I like my food too much. I am glad I did it though, it’s by far the hardest thing I have ever done and I don’t say that lightly but I am so glad I have raised so much money for a good cause. Thank you to everyone that sponsored me! Thank you to Chris for recording 10 hours of BBC London for me.